Working Remote, or Remotely Working? Today almost four million employees work from home at least half the time; about a quarter work from home regularly. As a small business owner, you may be working—right now—from the kitchen table, a coffee shop, hotel lounge, or a coworking space. By working remotely you’re part of a fast-growing trend in the modern workforce. But no matter how great it is to be able to work from anywhere, it also takes a healthy dose of self-discipline to be as productive outside the confines of an office as you are within one. 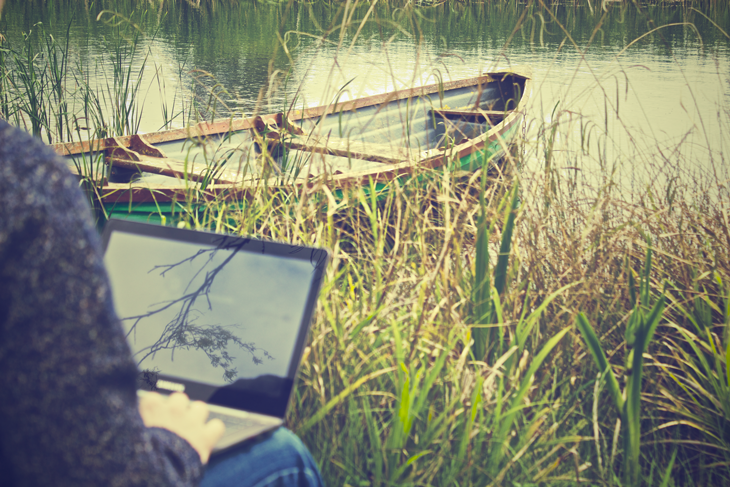 In other words, it’s easy to go from working remotely to, well, remotely working. Communication is a crucial part of developing trust when you work remotely or with remote employees and teams. Use all the digital tools at your disposal to stay abreast of what’s going on, attend meetings, and stay connected throughout the day. Use email, Facebook, iMessage, Facetime, Google Hangouts, Skype, video and/or phone conferencing…. you get the idea. Whatever it takes to attend that meeting or be involved in the brainstorming session, technology can get you there. Be especially careful with email. Although it’s great for relaying and receiving logistical and tactical information, updates on projects, quick questions and data sharing, it’s easy to create a web of long email chains that cause tasks and documents to get lost in the suffle. Instead, try using Slack or Basecamp project management tools to keep everyone on task and keep your email inbox clean. And, if the issue you’re dealing with is complex you should pick up the phone. If you’ve got a team that needs guidance or feedback as they tackle a challenge, video conferencing can work well. It’s important not to be at home working, assuming you’ll be contacted if a problem arises. Stay in touch with your chief lieutenants so that you aren’t chasing the ball when it starts roll down the hill. Set clear goals and expectations for remote workers, including yourself. Lay out how you will support remote employees, how and when you will check in. Make sure that if you have employees spending more time working outside the office than inside, that you have regularly scheduled phone calls or video conferences with them. Start the week with goal setting—check in with your remote workers to discuss what will be accomplished that week, when and how you will connect to get updates on the progress of their work. If, as the business owner, you prefer to work remotely, you’ll have to set specific goals and expectations for yourself, deciding what will get done each day, each week and each month. Whether you’re working from the office or remotely, you should always have evolving short-term goals and more stable, long-term ones. It might help you to stay on track by checking in with someone too—your business partner, a board member, or a coach—with whom you have a call every few days or once a week to make sure you’re hitting your goals and staying focused. If you get an email or voicemail from an employee or your manager that is confusing, frustrating or alarming, don’t complicate matters by shooting off an abrupt or equally confusing response. Take a minute to ask some clarifying questions and be explicit, because you can’t just run down the hall to this person’s office and get a better explanation or interpret their facial expression or tone of voice. Try copying and pasting the exact part of their email that’s troubling you and ask questions specifically about it. The same technique works well on the phone too—repeat what was said that you don’t understand and then ask pointed questions. If you’ve got sales reps and other kinds of employees working remotely, make sure you are tracking sales metrics and seeing their numbers regularly during the week. Numbers tell a story, and if they seem off, you can get on top of a developing issue quickly by finding out if there’s a deeper problem with the person–or the business. Numbers are also a way to know that an employee or team member is doing well, which you want to acknowledge and support. If those working remotely are trying to accomplish tasks that don’t have numerical targets, create project milestones so that employees with less concrete deliverables also have a way of measuring and illustrating their progress and successes. Treat remote employees like the full or part-time employees they are—not 1099 contractors or freelancers. Your remote workers still have career ambitions and are interested in growing with the company. Keep them in your sights—even if they are out of actual sight—for new projects and additional responsibilities. By fostering independence and rewarding their self-discipline and motivation interesting new projects and more responsibility, you’ll build long-lasting loyalty among your staff. And if you’re the one doing the remote work, remember to act in the same way. You’re still running a business—be it from afar—so keep it professional.